I know what you are thinking. “But, social media doesn’t apply to B2B” FALSE. Social media marketing can actually be more valuable for a B2B company than B2C. Think of it this way: In the B2B industry, you commonly see a higher average price point targeting a smaller customer base. In addition, the B2B customer decision funnel is greater influenced by customer referrals, word-of-mouth and business reputation. So, turning your customers into advocates of your company returns a greater reward when manufacturing $20,000 industrial equipment, than selling a $5 bottle of shampoo. 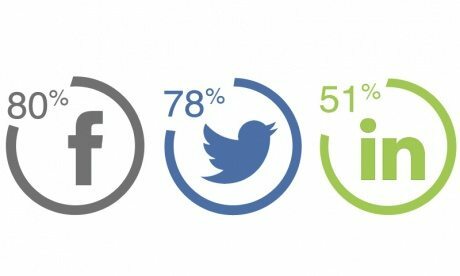 Social media helps B2B businesses acquire and retain clients, demonstrates their authority as experts, and builds their reputation in exceptionally tough markets. Learn more about the direct benefits your B2B company can gain by launching a social media marketing campaign. According to a 2015 B2B social media marketing survey, B2B business owners reported increased traffic as the number one benefit seen from a social media strategy. Social media platforms, especially Twitter, allows you to have interactions with industry influencers who you would probably never be able to get in front of otherwise. As well, Twitter has the largest potential for reach, allowing you to blast your content and message throughout the platform, riding on industry related hashtags. The B2B market typically has a longer and more complex sales cycle than the B2C market, meaning that a captivating and consistent social media marketing strategy is even more important to driving website traffic and funneling conversions. The top social platforms of choice for B2B marketers are Facebook (80%), Twitter (78%) and LinkedIn (51%). LinkedIn is proven to be almost 3X as effective as Facebook and Twitter for lead generation, although 49% of B2B companies aren’t using it. A company LinkedIn profile is a great avenue to showcase your products, services, and available job opportunities. By posting press releases, relevant blogs, product launches, awards, and even announcements you not only get your content in front of professionals but also position your company as an expert in your industry. So, if LinkedIn is so valuable why are B2B companies putting efforts into Facebook? I mean, ‘No one is going to follow my business on Facebook’, right? You might be right, however, a successful social media campaign starts with the right strategy. Your target audience is out there, it’s a just a matter of how you find and target them. It’s all about Building Community. So, you are absolutely sure that no one is going to follow your CNC Machining company on Facebook, so let’s get strategic and approach it from an ‘out of the box’ way. Let’s say you really want to build your awareness in the Oil & Gas Industry. Why not make a Facebook ‘community’ page (Community Pages are pages dedicated to a topic or experience that is owned collectively by the community connected to it), where professionals in this industry can engage with others with content, questions, etc. This way you can get your target audience to naturally connect with your company in an indirect, non-committal way. You, as the page owner, will have the only rights to post industry related articles (your own and others), press releases, trade show announcements, new technologies, etc. and your followers can engage with your content and each other through the comments. So, when your audience is finally ready to commit, your brand is front and center. No matter what platform, Facebook, Twitter or LinkedIn, ad costs are a fraction of the cost of traditional media spend. Most companies are even unaware of all the advertising options social media platforms have, from promoting clicks to your website to promoting fan growth, your opportunities are countless. Social media advertising offers a massive amount of targeting options to narrow down your audience; age, industry, job title, location, interests, homeowners /non-homeowners, parent/non-parent, income, credit card holders, etc. And with real-time feedback and instant campaign messaging changes, just like you can experience with Google AdWords, you can adjust based on the data to ensure the highest possible impact. Example: If you owned a manufacturing campaign looking to increase exposure to the aerospace industry, you could choose to run social advertising targeting LinkedIn members with the job title of ‘aerospace engineer’ with tailored ad messaging that when clicked would push over to your aerospace industry webpage. Increasing traffic to your website has many benefits in itself. So, why not use social media to promote your content and get more visitors to your website. If you have great content just sitting on your website, don’t sit around hoping the right people read it. Send it through your social media platform and get it in front of the right people. And if your content is just THAT great, why not put a few dollars toward promoting it with social media ads directly targeting your ideal readers. The benefits of a B2B social media campaign are many, from increasing website traffic to building new business relationship. When done right, a B2B social media marketing campaign can rival the creativity and appeal of some of the most popular consumer targeted social pages, and in return provide a measurable impact on your bottom line. Remember, the truth is even top business decision-makers use social media.